Abt No.3 resting in the West Coast Wilderness Railway running shed / workshop on 6 May 2003. This locomotive was built by Dubs & Co, Glasgow in 1898 as their builder's number 3730 a for use on the Abt-rack railway linking the rich mining town of Queenstown with the port of Strahan. It carries the nameplate "Mount Lyell No.3" but was more commonly known as Abt No.3. Abt No.3 and its four sister locomotives settled in to a life of hauling copper concentrates, mine supplies and general traffic over the My Lyell rack railway, supported by conventional locomotives on the non-rack sections of the route. The five Abt locos were originally coal burners but were converted to oil firing late in their working lives. 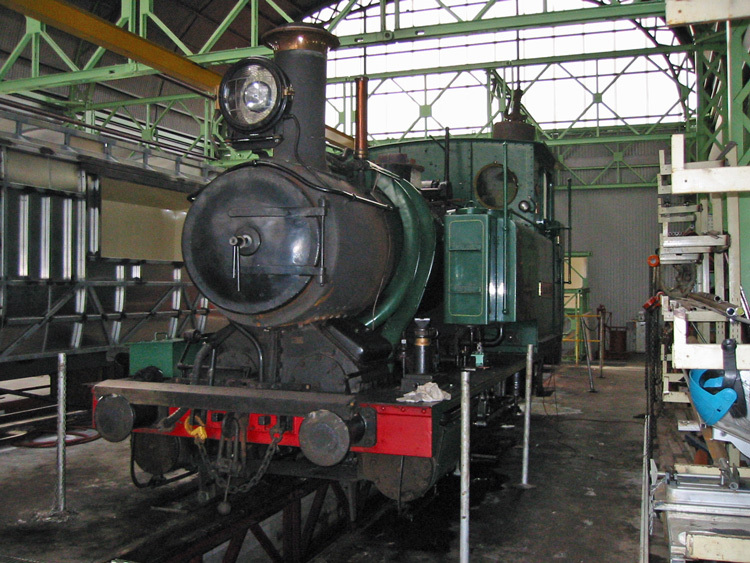 Abt No.3 was initially preserved in working order at Queenstown after closure of the railway in 1963. 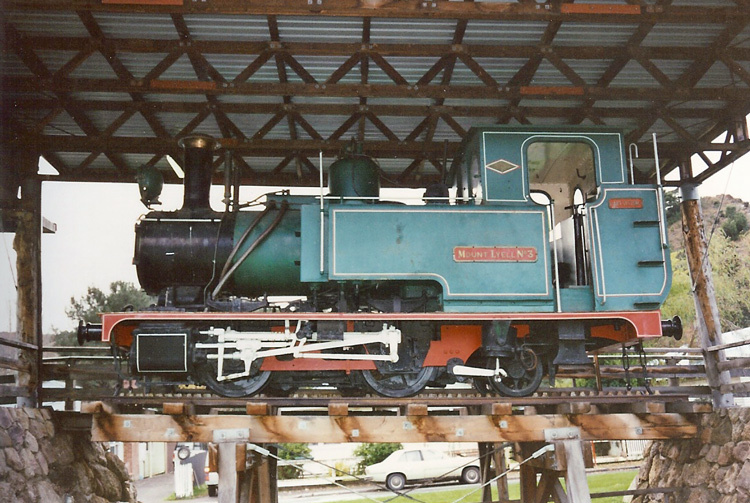 It was kept in an open cage on a short length of track in a grass reserve adjacent to the old station yard, and was still there in the early 1970's. b Abt No.3 was subsequently plinthed near this location, which became known as 'Miners Siding', on an elaborate plinth which replicated a timber bridge on the inclined Abt-rack section of the railway, and under a weather roof to protect the locomotive from the wet Tasmanian west coast climate. Light Railways magazine of February 2011 (Number 217) included a photograph and report of Abt No.3 having been recently overhauled and outshopped in black livery with red lining. Lou Rae has written a number of excellent books on the railways of Tasmania's West Coast, including "The Abt Railway & Railways of the Lyell region" which gives an excellent account of the building and operations of the Mt Lyell Mining & Railway Company, together with competing interests. Abt No.3 is seen here in May 1993 on its former plinth in the old Queenstown rail yard site. This interesting plinth was a replica of a timber bridge on the inclined Abt railway section, under a weather roof, and showing the Abt rack & pinion gear. Today the railway has again reclaimed this site and Abt No.3 is back at work on the old Mount Lyell railway route. b Information provided by Melanie Dennis via email dated 14 July 2004.